Come to the quiet! Natural Bridges: I could hear this rider breathing from a quarter-mile away. The Trail of the Ancients Classic is a 90.8-mile road bike ride in southeastern Utah. 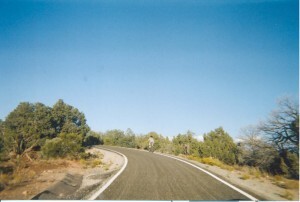 There are numerous climbs and descents, with several short, steep climbs and downgrades. The high elevation is 7,140 feet at Salvation Knoll, east of the SR 261 junction along SR 95. The low point is 4,847 feet in Mule Canyon, west of Comb Ridge along SR 95. 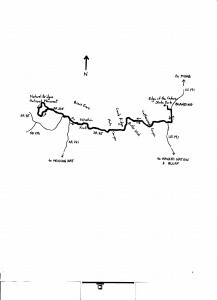 The ride starts and finishes in Blanding (elevation 6,167 feet at the start-finish point), and heads out-and-back on the Trail (40.7 miles each way), with a 9.4-mile loop through the Natural Bridges National Monument. Thus, the entire ride is on a National Scenic Byway. The Trail of the Ancients traces a 480-mile loop through the Four Corners region of Colorado and Utah, taking the traveler through the archeological and cultural history of, in particular, the Anasazi and Navajo peoples. Not to be outdone by the rich human history, the geology and scenery of this region are outstanding. This ride covers only a portion of the Trail; the entire Trail is highly recommended, though, for a motor vehicle tour. 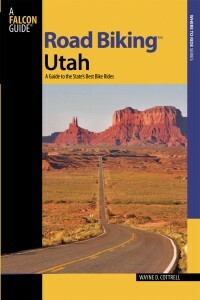 2012, is 310 miles from Salt Lake City, and 75 miles south of Moab, along U.S. Highway 191. As noted above, Blanding is situated in a rich cultural, archeological and geological region, with at least eight national monuments, parks and forests within a 100-mile radius. A study conducted after Hurricane Katrina concluded that Blanding is more immune to natural disasters than any other city in the U.S., perhaps making it one of the safest communities in America. Yet, always be cautious when bicycling on Blanding’s roads, as elsewhere! Exit the park and head south on 600 West, which is generally downhill, passing through a Blanding residential area. The road bends left after one-third of a mile, becoming Center Street. At the stop sign, at mile 0.8, turn right onto Main Street, which is U.S. 191. The highway passes through Blanding’s central district, making this the busiest part of the ride. Keep heading south, beyond the city limits, to the junction with State Route (SR) 95, also known as the Bicentennial Highway. Turn right here, at mile 4.9. A convenience mart at the junction presents a good opportunity to stock up on refreshments for the ride. From here, the aforementioned history and scenery begins in abundance. There are numerous historical sites that can be viewed by venturing off the main highway; this description focuses on what can be seen from the road. After crossing a cattle guard (there are several of these along the route) at mile 5.0, the highways descends steeply (8%), negotiating a few sharp curves that demand good bike-handling. The highway climbs from mile 6.1, and then begins to roll, as it passes through a red sandstone landscape sprinkled with low juniper trees and desert scrub. Another steep downgrade (8%) awaits at mile 8.4. Here, the highway winds and plunges through a breathtaking landscape of jagged rock formations, into Cottonwood Canyon. The descent ends at mile 11.0, after which the road climbs for two miles. The highway rolls for the next three and one-half miles; note the side roads, not all of which are paved, leading to sites of ancient ruins. From mile 16.7, SR 95 climbs adjacent a notable, striated rock face on your left. The highway crests after one mile, passing through a spectacular cut, and then descending the back side, toward Butler Wash (numerous Anasazi ruins in this area). At mile 19.4, SR 95 climbs – the shoulder is very narrow, but, thankfully, a climbing lane is provided for motor vehicles (meaning that traffic, which is very light out here, should have plenty of room to pass you). At mile 21.1, the landscape begins a gradual change. Note the petrified dunes on your right. At the crest, at mile 22.3, the scenery is decidedly different as you cross Comb Ridge, one of the most outstanding geological features of the ride. Comb Ridge is a monocline (uplift of the Earth’s crust in a single direction) that runs north-south, stretching some 80 miles into Arizona. The highway makes a long, sweeping “U” bend to the right as it passes over the monocline. Once over the top, it is a sharp descent into the Mule Canyon gorge, and the lowest point of the ride (4,847 feet). Enjoy the descent as, from here, SR 95 climbs to the highest point of the ride (7,140 feet, although a sign along the road at the Salvation Knoll viewpoint states 7,110 feet). Here, as above, the highway’s narrow shoulders is compensated with a climbing lane that allows room for passing motor vehicles. You are now at the 29.6 mile mark; during the climb, looking upward and to the right, you will have noted the Bears Ears (mountains) – perhaps so-named because the highest peaks appear to be shrouded in dark green blankets. The adjacent landscape is otherwise somewhat barren. From here, the highway descends to cross a couple of gorges (South Fork Fish Creek and Lyman Canyon). At the junction with SR 261 (mile 33.8), keep straight, remaining on SR 95. The highway continues to climb and descend through here. At mile 35.6, turn right onto SR 275, toward Natural Bridges National Monument. The shoulder is narrow, and weeds tend to encroach upon what little shoulder there is, but traffic volumes out here are very light. Enter Natural Bridges at mile 39.5. A visitor center is just up the road. A stop here to freshen up may be worthwhile. Once beyond the visitor center parking lot, bear right at the “Y” – you are now on a 9.4-mile, one-way loop road through Natural Bridges. This hidden gem was not “discovered” (that is, by non-native settlers) until 1883. The Monument features three of the largest-known natural bridges in the world: Kachina, Owochomo, and Sipachu. Each of the bridges can be seen from overlooks that require short walks from the loop road. You may be able to catch glimpses of the bridges from the road, but each one is worth the walk. The Monument otherwise features some sheer cliffs, spectacular sinks, sandstone formations, and expansive vistas, all of which can be viewed from the road. Of particular note are the Tables of the Sun, flat-topped mesa-mountains that can be seen off in the distance along portions of the loop. As for the road, it rolls through the Monument, constantly climbing or descending. There is a narrow shoulder on the left; none on the right. There is a short, two-way segment near the end of the loop, as you near the visitor center. After returning to the visitor center, possibly stopping one more time, return to Blanding via the reverse route. It is a 40.7-mile ride back to town. Although you have been this way, you are bound to discover things that you did not notice during the outbound ride. One article noted that visitors to this area feel compelled to return here, and it is likely that you will have a similar spirit!